I have heard so much about Millpoint Caffe Bookshop and one fine day, we decided to head down to Millpoint Caffe to give their brunch a try. Interestingly, this store is part bookshop and part cafe with seatings both in the bookshop and at the alfresco courtyard area outside. However, books are not allowed to be taken to the alfresco dining area. We arrived there around lunchtime and I was so surprised to see that the cafe was so busy although it looked small from the outside. Looks like I was wrong! 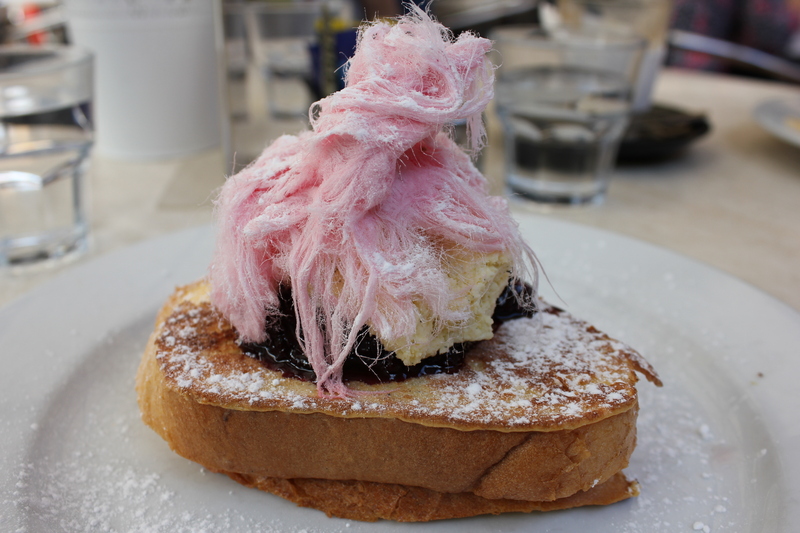 I had the French Toast ($14.50) topped with mixed berry compote, lemon and vanilla mascarpone cheese and Persian fairy floss. When my French Toast arrived on the table, I had a good stare at it for a while. It was presented beautifully with the Persian Fairy Floss like icing on a cake. The mixed berry compote and lemon and vanilla mascarpone cheese complements each other well with a lovely combination of sweet and creamy flavours. However, the toast itself was a bit dry and could be much better if it was moist or soaked through. Mum had the Trio of Sauteed Mushrooms ($14.50) which consists of a mix of mushrooms, goats cheese, mixed greens served on rye topped with a soft poached egg with a drizzle of truffle oil. There was a generous amount of mushrooms with a great variety. I had a test of mum’s dish and it was delicious with lots of earthy and tasty flavours coming from the mushrooms. 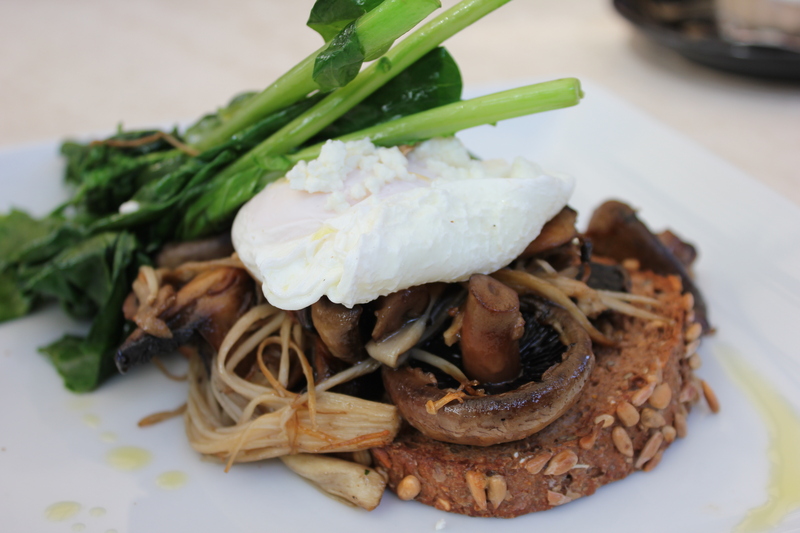 The eggs were poached perfectly too with yellow liquid oozing out and drizzling on top of the mushrooms and rye. This dish definitely shouts mushrooms galore or mushroom fest. Perfect for the mushroom lover. Apart from offering good food, Millpoint Caffe also offers a good selection of cakes, pastries and slices to choose from. It was hard to make a decision but in the end I had the Orange and Almond Cake ($7.50) and the Lemon Meringue Tart ($4.50). I think what Millpoint Caffe has executed well is their cakes. 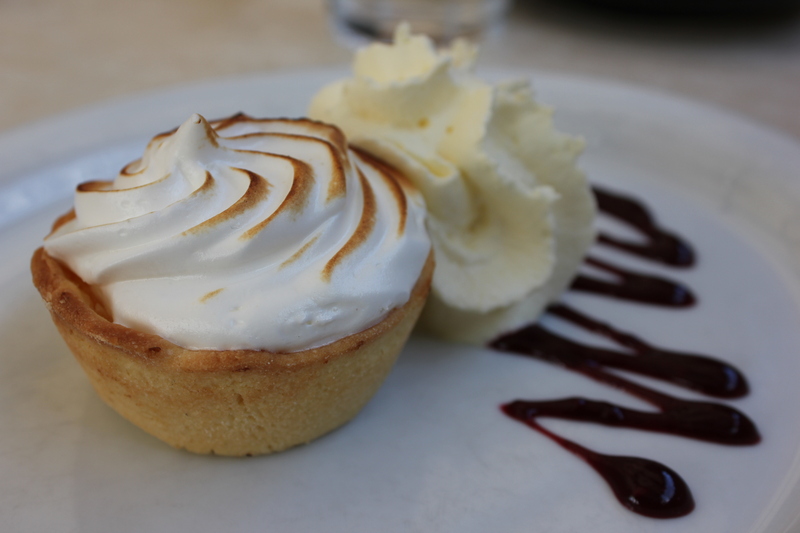 The Lemon Meringue Tart had a lovely lemon flavour with a smooth meringue and a well executed pastry. 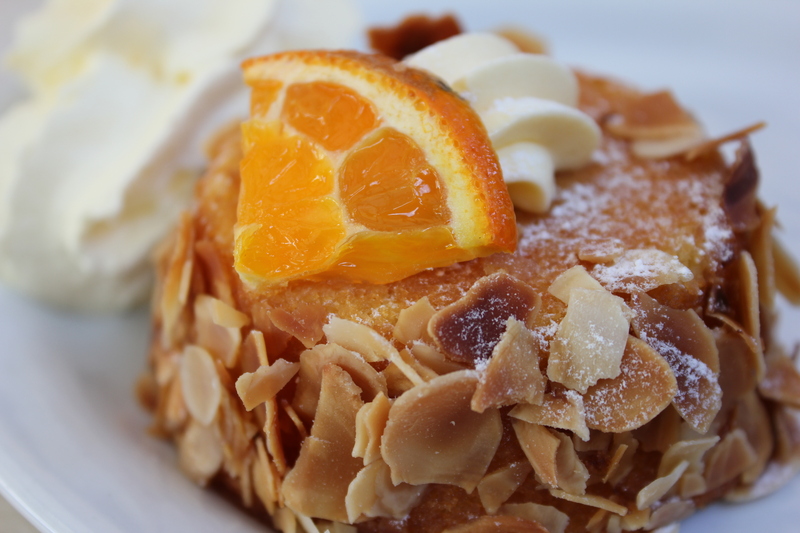 The Orange and Almond cake was another one of our favourites. It was moist and not too dense with a subtle hint of tangy sweetness. What I liked about Millpoint Caffe is the atmosphere. It is simple, relaxing and comfortable which makes it great to catch up with friends over food, coffee and a cake or even getting lost in a book while sipping your coffee. The service – friendly and welcoming. My only advice to you is to come during off peak hours as it can take up to 30 minutes for the food to arrive on your table if it’s busy unless you don’t mind waiting. Apart from that, I guess it’s worth a try! Oh, and you can also use your Millpoint Caffe entertainment voucher here and get 25% off the total bill!